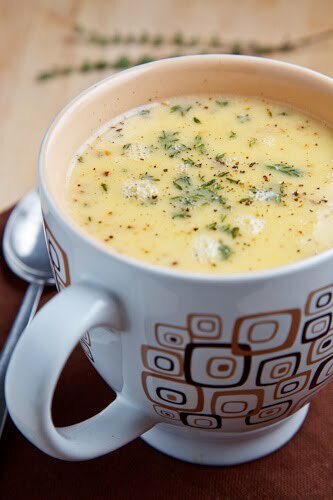 A creamy white cheddar cauliflower soup with a hint of thyme. Although the winter has been pretty mild so far I have still been enjoying some hearty soups with the most recent one being this roasted cauliflower and aged white cheddar soup. It never ceases to amaze me how simple vegetable soups like this one can be so good with so few ingredients and that might be why I keep coming back to them. The main vegetable in this soup is of course the cauliflower and it is roasted before being added to the soup to concentrate its flavour and to get a bit of caramelization going. Up next is the basics with the onions and garlic followed by the herb of choice, thyme and finally the cheese. For the cheese I went with a white cheddar and one trick to keep in mind when adding cheese to soup like this is that if you use a stronger flavoured cheese like an aged cheddar then you will not need to use as much of it to get the same flavour. This soup can be amazingly creamy if you use heavy cream for some of the liquid but you can keep it on the lighter side by using milk. If you are not worried about trying to keep things on the lighter side then cook some double smoked bacon for garnish and use the grease to saute the onions and garlic. This will add even more flavour and a really nice smokiness. Toss the cauliflower florets in the oil along with the salt and pepper, arrange them in a single layer on a large baking sheet and roast in a preheated 400F/200C oven until lightly golden brown, about 20-30 minutes. Add the broth, deglaze the pan, add the cauliflower, bring to a boil, reduce the heat and simmer, covered, for 20 minutes. Puree the soup until it reaches your desired consistency with a stick blender. Mix in the cheese, let it melt without bringing it to boil again. Mix in the milk, season with salt and pepper and remove from heat. Slow Cooker: Implement step 1, optionally implement steps 2 & 3, place everything except the cheese and milk in the slow cooker and cook on low for 6-10 hours or high for 2-4 hours before adding the cheese and milk and cooking until the cheese has melted. Note: The amount of broth that you are going to need will depend on how large your head of cauliflower is and how thick or thin you prefer the soup to be. I have been in love with cauliflower this season – and cheese makes everything better. This soup sounds perfect, even for our abnormally mild winter. This looks fantastic! I love broccoli and cheddar soup, but I've never had it with cauliflower…sounds really delicious, I definitely need to give it a try! This looks way too yummy. i kept seeing this ALL OVER pinterest. figures it's from this blog! can't wait to try it! I use the one quart size chicken broth, bring to medium high and add sliced carrots, celery and chopped yellow onion. Bring to boil and add frozen dumplin’s reduce heat to simmer ‘til dumplin’s are cooked. Approx. 10 – 15 minutes. I guesstimate the amounts by having an eye pleasing mix of the colors of the ingredients, and in the amounts to serve the number of people to be served. A gorgeous soup! I love cheddar cheese. That combo is wonderful. As always this looks great, yuuuum! Caramelized cauliflower is a great base for your soup.Looks delicious. Even though the weather hasn't been super cold, I crave soup constantly and I love how creamy delicious this is! Can't go wrong with veggies and cheese! My daughter LOVES cauliflower!! I need to try this very soon! Looks really good and easy to make, thanks for sharing! I love the idea of roasting the cauliflower and using the bacon grease, and the smoked bacon. It may be rich but it isn't like a person is going to eat it every meal or even everyday. Also if you can't get double smoked bacon .. you can always add a drop or two of liquid smoke. what a beautiful bowl of soup! I like the aged cheddar part the most! Lovely! Yum! I love that you roasted the cauliflower instead of cooking it right in the soup. I just discovered your site recently on a random internet search and loved the recipes and pictures! I can't believe this is what you do in your "spare" time. You make the rest of us look lazy. I was getting more acquainted with "social media" reading this morning and saw your recipe on Pinterest. I saw that it was Closet Cooking and got SO excited. Keep up the good work. I love cauliflower. This soups looks delicious!!! Cauliflower soup is the happening thing in the blgoshere lately. I think yours is better than mine though. Cheese, heavy cream (YES< USE THAT) and bacon. Sounds wonderful. Making this now with a few turnips..and the cauliflower form a veggie tray. Wonder if you can smell the yummyness coming from the Eastern Shore Nova Scotia 🙂 Thanks for the inspiration! Hi Kevin – I love your photography and styling for this post – I'm also a big if distant (Liverpool – UK!) fan of your blog. This looks delicious, I'm looking for recipes where I can incorporate some of the ingredients into purees for my little baby, so this is ideal. Also like the idea of cheddar instead of stilton for a change. Will give it a try over the weekend. Hope you are well in Toronto! OOOh….I cannot WAIT to try this one! This looks excellent, what a great combination. OOh, I cannot wait to try this! This combination looks and sounds delicious! Thanks again for another wonderful idea! Made this tonight and it is wonderful! Only had 1 cup aged cheddar and 1 cup no fat l/2 & l/2. Sauteed some mushrooms and tossed those in at the last minute. Perfect. I'll freeze the leftovers for next week-end. Salivating here. This recipe has my favorite ingredients *and* it becomes one of my favorite meals. Long live soup! And fat! This looks fab! I love roasted cauliflower and adding it to soup is genius! Thanks for the recipe! I had oral surgery this morning, and this was perfect! I used only 1 cup of cheddar and skim milk. Pureed the soup in my VitaMix. Yummy! Found your site on Pinterest. I'll be checking out more of your recipes. I made this recipe tonight with BLT's and it was fantastic! Thanks so much!! I will be adding this to my go-to favorites. THis sounds delicious. I've been cooking a lot with cauliflower lately so I'm excited to try this recipe soon! Heavenly — easy to make and just delish!! I add a little white wine to the broth (maybe 1/3 cup) and it was terrific! I can't remember how I got to your site, but I stumbled on this recipe and wanted to make it because I have never had cauliflower before. First off, the roasted cauliflower by itself was fantastic. Second, the soup was amazing. Probably one of the best soups I've had a chance to make this year. Delicious! This soup was a big hit! I made it with bacon and cream (so much for light & healthy). We love garlic, so I roasted some garlic with the cauliflower and threw that in, too. Thanks for a great recipe! I'm a foodgawker addict and I swear every single recipe you post goes into my favorites. I'll add something and then look at the website later and go–oh, it's that guy again, I LOVE his recipes! Thanks for all the inspiration and yummy dinners. I love seeing what you come up with! I made this over the weekend for my family (rave reviews!) My only tweak was to add a can of white beans to the simmer and then pureed with everything else. Added some nice body and extra protein and fiber, which I'm always trying to push on my kids. They really liked it. Thanks for another excellent recipe!! I cannot believe that I've never discovered your blog before! How completely deprived I was! 🙂 So glad I found your amazing blog and I'm definitely going to read it often. Made this a couple days ago with Romanesco instead of Cauliflower and it turned out beautiful, thank you for sharing this. I ended up doing a double batch since my Romanesco was huge, and I found it works as a great base to adapt. Yesterday's lunch I added chipotle powder and sour cream, and today it was extra garlic and pesto, worked out great both ways. Huzzah! Unknown: I also enjoy using white beans in soups like this. They add a nice creaminess when pureed and let you cut back on the cream a bit. Amy: The pesto would go well in this soup! This soup is so good. You MUST add Bacon. It gives it a lot of flavor. This was so good I picked up my bowl and drank it! I left out the pepper (hate black pepper with a passion) and thyme (store did not have any fresh thyme and I wasn't going to buy a bottle of the dried for one recipe). I went ahead and used the full box of veg. stock which was 4 cups. I used a 7oz. block of aged cheddar and it was perfect for the 1.5 cups of grated cheese. I went with fat free half and half and didn't feel like I was missing anything. Thanks for the recipe! I am no longer supposed to eat raw cauliflower raw because it is goitrogenic, but most of the goitrogens are inactivated by cooking, so this was a perfect way to satisfy my craving for cauliflower. I just made this soup for dinner tonight and it was amazing! Thank you so much. I made it with half the cheese and really fresh cauliflower. It was great with some toasted sourdough. I made this a few nights ago, and I'm already wondering when I can make it again. It was the perfect – it had great flavor and was very smooth and creamy. So good. 5 stars for sure. this soup is amazing! my whole family enjoys this (including small kiddos)! i use skim milk and it is still very creamy. i tried it today with purple cauliflower… oh it's so pretty! same great flavor with some added antioxidants! thanks for posting this! I made this tonight (I skipped a step and roasted the onion in large slices with the cauliflower. I also took a small bulb of garlic and wrapped it in foil and tossed it on the pan with the veggies.) This soup is absolutely amazing! Really really good! The cheddar added a really nice flavor (I'm not the biggest cheddar fan, but this was great!). Paired it with a batch of ranch roasted red potatoes, and a slice of baguette! This looks fantastic! And amazingly low carb, this *is* healthy food. And your suggestion about bacon just makes it that much better. Definitely going to be making this soon. Thanks for posting!! I just finished making this! It was delicious. However mine was super thick and I even used extra broth… and it was all like thick like baby food or something. Not sure how I will fix it, maybe its how much I blended it? Anonymous: This recipe really wants a smaller head of cauliflower and a larger one will make it thicker. If I cannot get a small cauliflower, I use half of a larger one and save the rest for snacking on roasted with a dip. I found this recipe on pinterest and made it for dinner last night with double the garlic. so so good! thank you! I calculated out the calories on this if anyone cares.. I tried your recipe for a party of 10 last night and it was absolutely fantastic. Thank you for sharing such a great recipe! Anonymous: I am glad to hear that the substitutions worked! They sound good! Thank you thank you for having a printable version! I make monthly meal plans trying to use a new recipe once a week and I search pinterest for them. All too often I end up printing multiple pages that I don't need. Can't wait to try your recipe! Just made it and love it! Much better than the old recipe I had for a cauliflower cheddar soup. Just used regular orange old cheddar but also threw in a rind from parmasean cheese while the broth and cauliflower simmered, then took it out before blending. Great soup, love the roasted taste! Thanks! This soup sounds and looks SO good! I can hardly wait to try it. I will be going with heavy whipping cream (not milk). I might top it off with a few piece of bacon, like you did. Definitely having hard bread with this – just like your photo shows. I can hardly wait!!!! I just made this soup and it came out delicious! I made a few small additions and substitutions. I used 2 cups of chicken broth and a half cup of water and a half cup of white wine to make up the liquids. I added a can of small white beans to the cauliflower. I used half fat free half and half and half milk. It came out great and was pretty simple. This was HEAVEN! Thank you so much! I only improvised and used turkey bacon but it turned out wonderfully! This looks so delish and it's low carb! I love your great variety of recipes. And bacon just makes the world a better place, which I think you would agree 😀 Can't wait to make this!!! Rona: Yes you can definitely freeze this soup! When reheating you don't want to bring it to a full boil though as the cheese may separate. Just gently bring it up to a simmer and enjoy! i made this last night, and it was amazing! thank you for the great recipe — it will be wonderful this fall and winter! have a great day! I am eating low-carb, and made this for dinner tonight. It came out great! I had fresh basil, so I used that as a bit of topping, and I had some black forest ham, so I cut that into ribbons for a garnish. (I used a cup of half-and half cream) The taste reminded me of macaroni and cheese! Yum. Made this soup today and it was absolutely to die for!!! I would not change a thing…..loved it!!!! Came over from Pinterest to see the recipe. 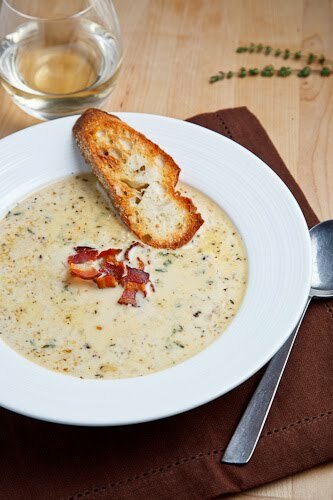 We love soups in the Fall and Winter. This one sounds fun and yummy. It's a bit different from my regular cauliflower soup so I can't wait to try it! What would you recommend using to purée the soup if I do not have a stick blender? What would you recommend using to purée it he soup if I do not have a stick blender? Meg: A stand blender or a food processor would work in place of a stick blender. Just made this tonight. Used three strips of bacon and crumbled them, simmered them with the soup and then blended them along with everything else. And fresh thyme! It was fantastic, thanks for the recipe! I made this tonight. I used three strips of bacon, crumbled them and simmered them in the soup and then blended them along with everything else. Added fresh thyme, and delish! Thanks for the great recipe! I just made this soup and while tasty, the aged white cheddar makes it extremely rich- I would suggest cutting the cheddar with another cheese and thinning it out somehow. I would love to crock pot this after roasting the cauliflower. Any suggestions? Anonymous: You can just throw all of the ingredients other than the cheese and milk/cream into the crock pot after roasting the cauliflower. You don't need to cook it for that long, 20-30 minutes at high or an hour or two at low will do but you could also cook it at low for 8-9 hours if you want to start it in the morning and have it be ready at night when you get home from work. After it is done cooking, turn the heat off and mix in the cheese, let it melt and then add the heavy cream. Enjoy! I just made this! OMG! Eating it right now. I topped it with goat cheese and shaved a 12 month old Mimolette on top. I am in heaven right now. BTW, I didn't add cream or milk as it was nice and thick and delicious without it, so why add calories? I also used chicken broth rather than veggie because that is what I had. Soooo good! Thanks! I made this 2 nights ago. Soooo good! This soup is DELICIOUS! I had to fudge a few ingredients based on what I had on hand (chicken broth for vegetable broth, oregano for thyme) and it was still great. It was just a little runny; I don't think I had quite enough cauliflower. The bacon sounds like a great addition, but I'm trying to keep it on the healthier side. I made this about 2 weeks ago, and it was wonderful, so I'm making it again for Thanksgiving. I am going to try adding a can of white beans to the recipe per some of the suggestions left here. We are having several people, so I'm going to have to make a few batches. Do you think it would be easier to make the batches separately and then combine them when they are all done, or just triple the recipe and do it all at once? Tricia M.: I am glad that you enjoyed it! If you have a large enough pot it would probably be easier to do it all at once. You may need to roast the cauliflower in several batches though. Yum! The soup was wonderful. Thank you for such a great recipe! This soup is perfect!!!! I didn't have vegetable broth so I used chicken broth. I also sub.salt with celery salt. I think next time I will sautee alittle diced celery with the onions. I used light cream and my family loved it!!!! This recipe is a keeper! This was excellent!!! It is a keeper! Thank you for sharing! This was excellent!!! Thanks for sharing!!! love love love this soup. So perfect! Making this for dinner! Looks (and smells) amazing!!! I just happen to have some cauliflower in my fridge, guess what I am having for dinner? pinned it yesterday, made it today…awesomeness…I made the following subs, gruyere cheese and almond milk, and I used 4 cups veg broth, since my cauliflower head was pretty big. thanks for sharing this, great recipe. I love the idea of roasting the cauliflower before make the soup. Must be a fantastic flavous! First, the recipe doesn't say what type of oil, also, if it takes time to cut, toss and roast the florets in the oven that time should be added to the prep time. Therefore the "Prep" time is NOT 10 mins…..just saying. It was sooo good!!! i actually added some spinach and a little Parmesan cheese.AMAZING! Anonymous: The thickness of the soup is going to depend on how large your cauliflower is. If you have a larger head of cauliflower you may need to add more broth. Looked so good and have wanted to make for a long time. But very disappointed . . . Did not like. Leftovers of this soup, when it thickens overnight in fridge, is also AMAZING on top of baked potato too!! Anonymous: I like the baked potato idea! This was fabulous – thank you for sharing your recipe! I found your blog a little over 3 hours ago, and have already made and eaten this soup. It was delicious!! My whole family, including the littles, loved it. I'm so excited to have found your blog and I've been pinning recipes like crazy. Thanks! is there a way to puree the cauliflower if you dont have a stick blender? Anonymous: You can use a blender or a food processor, transferring the soup to it in batches. Made a half recipe with leftover cauliflower and it was yummy. I love lots of black pepper on cheesy soups. Next time I make this, I'm going to find some excellent cheese. I used a pretty plain Vermont white cheddar, but I see how a really nice aged cheddar will add that extra bang. Can't wait to make again. BTW – A stick blender is such an essential appliance. I find myself making soup all the time since I got one. So much less messy and dangerous than using my food processor. Wondering if it's ok to sub almond milk for regular milk/cream? Anonymous: Almond milk should work! Just made this for the second time, yum yum! I made this at a soup competition that my work hosted and won! Thanks for sharing this yummy recipe! I just made this and it is delicious! I had some rye bread in the freezer that I toasted to dip in the soup and it is a great combo! Hello, I just made this soup the way you do and you're right, it's delicious. I will make it again and try your other soups. Thank you very much. Made this soup last night and it was delish! I find that pure cauliflower is a bit bitter for my taste so I added in a bit of regular potatoes and sweet potatoes to make it a bit more creamy. So yummy, thanks! Always a positive when my creation turns out exactly like your pictures. Very delicious. I added a small amount of parmesan cheese. Does this stuff freeze okay? I live alone and most homemade soup recipes yield way too much for me to eat before it starts to taste off, but some recipes don't all freeze well. Asking because this sounds lovely and fall approaches. Meg; Yes this freezes well! Enjoy! Great dish for a crowd! I doubled the recipe for my Meal Share group (see http://www.mealshareplan.wordpress.com) and had PLENTY leftover. Wrote about it in our meal review this week. I make a similar soup but add Goat Cheese and fresh grated Nutmeg. I have a soup business and I can't keep this one in stock! Cauliflower Soup of any kind is amazing. this soup is fantastic. I tweak it by using shallots instead of onion and add a Tbsp of Reyes Winter Garden mustard (our favorite mustard in the world!). Thanks for such a great recipe! This has been on my Pinterest board forever, but I just finally made it. I was not disappointed!! So delish! I wonder, have you tried adding a dark beer, like a stout? I feel like it could be a good flavor combo. Kellie Colunga: I'm glad you enjoyed it! Beer would be a nice addition! 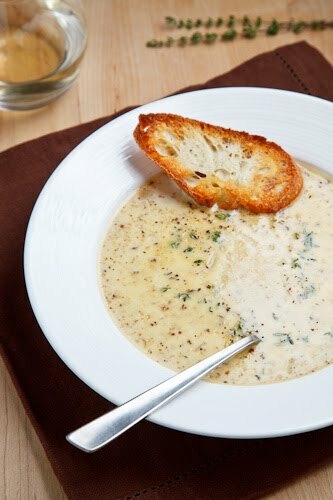 I've made this a half dozen times now and it's one of my favorite soups! A winner every time. Especially with crisp bacon on top! 🙂 (I use chicken stock). Evelyn: I'm glad you like it! This is my favourite soup! Holy moley this was amazing!!! I didnt change a thing. I've already passed the recipe off to a few friends! Thanks Kevin! My wife and I both love cauliflower in various forms and this soup is one of them. We typically give up meat for Lent so it's a great time to revisit 100% veggie meals. Kevin, have you tried cauliflower steaks? The other day I made them piccata style? So good! Search online as there are many recipes. Keep it up! So yummy! I took the lazy route and roasted the cauliflower, onion, and garlic together for 40 minutes. Then I pureed it and added it to the stock and milk. I love how your recipes sound — however, I really do wish you'd use measurements, i.e., cups? ounces? How much is a small head of cauliflower? How much is a big potato? I did the bacon with this. I am keto so used coconut oils and almond milk. I do not recommend doing that. my soup tastes like grits not soup ( probably because I used an actual blender not a stick blender. I wish I could hit a couple reset buttons…. wahhh!!! This soup is delicious. I threw in a small bag of organic cauliflower florets I bought from Costco. I’m guessing the bag had more cauliflower than was intended for this recipe, and it needed more liquid. So, I added an additional cup of homemade chicken stock. Lacking aged cheddar, I used a combination of sharp cheddar, parmesan and romano cheeses. I thought it was perfect! Thank you so much for the recipe. I’ve had this pinned forever but never made. I had a cauliflower in my fridge so decided to make it. It did not disappoint. It’s the perfect keto soup! I’ve had it for lunch every day this week! I also have had this pinned forever!! So today I was having my Mom over for lunch and decided to give it a go. I freaking LOVE this recipe!! I had a very small head of cauliflower ($5.99 Canadian for a very very small head) I cooked the soup to just before the milk/cream addition. I tasted it then totally forgot to add the milk!! But it was so wonderful it wasn’t missed. Next time (and I will make it again and again) I will add the milk just to see which I prefer. Also, I think a normal head would definitely amp it up. And one other commenter said they roasted the onion and garlic with the cauliflower I think is a great idea…going to try that!! Am going to double next time as well because this is a soup you want to eat again and again! !